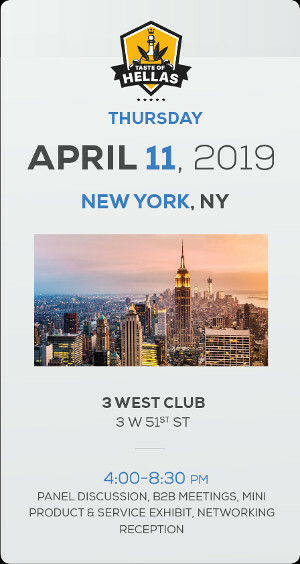 Hermes Expo 2019, the premier International Trade Show and Exhibition for Greek, Greek American, and American businesses and professional services, will take place from April 8 to April 11, 2019, with three events spread across three cities. Come explore this year's theme, Trade, Tourism, Investment Opportunities via Gastronomy, through booth exhibits featuring an array of businesses and professional services along with panel discussions on finance, energy, investment opportunities, and gastronomy! Hermes Expo International will present Taste of Hellas in conjunction with the EMBCA and the QCC. The event will include a panel discussion with experts in Importing- Exporting, Tourism, knowledgeable people of Greek Specialty foods and Wines, B2B meetings, mini product & services exhibit with the best imported Greek specialty food and wines and networking reception. A series of events held annually in New York, Philadelphia and now in Washington, DC, the Hermes Expo combines executive and exclusive level networking opportunities, professional development seminars, educational panels and a trade show exhibition platform for professionals and businesses seeking to grow and expand. Hermes Expo events attract business leaders from diverse industries and professional services. Hermes Expo events feature unique platforms for companies to showcase their products and services in front of potential customers from the United States and Europe. Hermes Expo brings together Greek American and American owned business from various industries Hospitality industry, Banking & Finance, Insurance, Legal Services, Investment Opportunities, Foodservice Distribution, New Technology Importers and Exporters and more. Hermes Expo also organizes the “Taste of Hellas”, the Hermes Expo Awards Dinner & Entertainment and awards scholarships to students of Hellenic descent.